We're making it easier for people who live, work or shop on Oshkosh's west side to use the library. Now you can place books, DVDs and other library materials on hold and pick them up at the newly remodeled Manor Building at Evergreen, 1130 N. Westfield St. 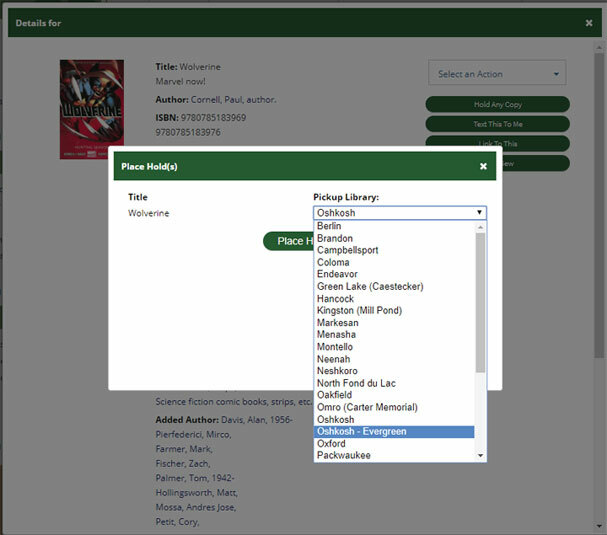 When placing your hold in the library catalog, select Oshkosh-Evergreen in the drop-down menu as your pickup location. Library staff will call you when your items are ready to be picked up at Evergreen. You can also return library books and other materials to our drive-up drop box at Evergreen. Just drive through the circle driveway at Evergreen's Manor Building, 1130 N. Westfield St., and drop off your library materials. Evergreen will bring them back to the library daily. The drop box will be closed on major holidays and other days when the library is closed. For more information contact the library at 236-5203.